One of the biggest trends in the construction industry is warm mix asphalt. Warm mix asphalt is a different process for mixing, hauling, placing and compaction asphalt mixtures. It is a greener process that has less impact on the environment, with reduced hydrocarbon emissions and greenhouse gases. Due to its lower temperature, it is also safer for construction workers to use. Warm mix asphalt is produced using temperatures 30 to 120 F lower than what is used for traditional hot mix asphalt. Less energy is needed to heat the warm mix asphalt, so it uses less fuel, decreasing the plant's carbon footprint. Warm mix asphalt has an initial cost higher than traditional hot mix asphalt. On average, warm mix asphalt costs between $3 and $5 more per ton than hot mix asphalt because of the additives that need to be added. Warm mix asphalt uses less fuel and can be placed faster than hot mix asphalt. Additionally, it is easier to transport and can be shipped over longer distances than hot mix asphalt, making it more cost-effective. Warm mix asphalt is very efficient and versatile. It can be used for a variety of purposes, including different road thicknesses. Whether a whole new road needs to be created or just a pothole filled in, warm mix asphalt can provide the correct levels. It is durable enough to stand up to heavy traffic, so is a good option for highways and freeways. For workers who deal with construction sites, warm mix asphalt is a much safer and healthier option. At the production plant and on-site, there are fewer fumes and smoke to inhale, minimizing lung and respiratory issues. This is particularly important in areas with poor ventilation, where hot mix asphalt was a serious health concern. Since it also has fewer emissions, warm mix asphalt can be used for paving even on days with poor air quality, something that would be impossible with traditional asphalt mixtures. This benefit helps minimize construction delays and keeps projects on track for completion. While warm mix asphalt has been used in Europe for decades, it's still relatively new in the United States. It is quickly becoming a mainstay in construction and paving due to its versatility, impact on the environment and its effects on workers. 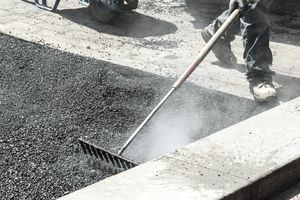 Since it is a more cost-effective option and is safer for both workers and the environment, warm mix asphalt is a popular trend that is poised to revolutionize the industry.